First of all, apologies for not updating the site much in the last 3 months, but thank you to all those who have sent me e-mails in that time, the feedback has been most welcome. 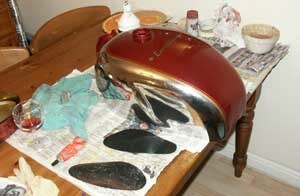 Admittedly I have not done much on the Vincent restoration recently, but read on and I'll tell you why. The early part of 2003 did not start particularly well, but as I keep reminding myself . . . could have ended far worse. I ride the Honda Fireblade to work all through the winter (apart from when I cant be bothered and take the car!) and in my dinner hour one day in the middle of January I used it to visit my bank in the centre of Leicester. Unfortunately, just before I got there, a 'Blue Van Man' (with bullbars) decided he was not going to stop at the junction I was just going past and I became a rather large bug on his windscreen. I have spent the last 20 years avoiding prat's like this one, and had forgotten how much it hurts coming into contact with blunt objects moving at high speeds. (actually having had quite a few 'off's' while racing, in the split second that I saw the van before impact I genuinly thought it was 'lights out' time). The resulting impact left the Fireblade written off and me with broken kneecap, damaged hip and various cuts and heavy bruising. I spent 5 days in hospital realising just how lucky I was and trying to figure out how I was going to race my go-kart (latest hobby) with my leg in plaster from the groin to the ankle. Incidentally, if you want an advertisement for how good the recent developments in motorcycle clothing have been, you should have looked at the bruising around my elbow and shoulder, in the shape of my jacket's body armour - I tried to imagine what my elbow would have looked like if the armour had not have been there. As always, even though the police confirmed at the time that they would attempt to prosecute the van driver, and I had multiple witnesses to support my case, it has still taken months for anything to happen, but at least his insurance company has now admitted liability. It's now six months later and although I'm back on a pretty nifty step-thru (see photograph), I'm still having problems with the damaged hip and dont feel the leg is strong enough to take the weight of a big bike. Anyway, there's one excuse for my lack of Vincent progress. 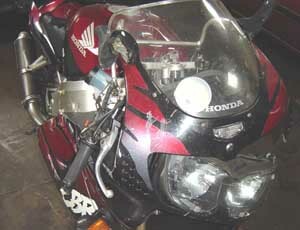 Fireblade after being hit by van, looking very second hand. Was subsequently written off. 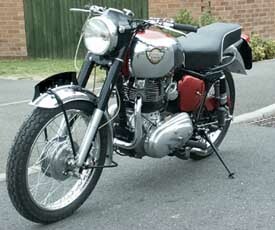 The other reason for lack of Vincent news is that I recently (God forbid) started work on one of my other bikes, a 1961 Royal Enfield Constellation. 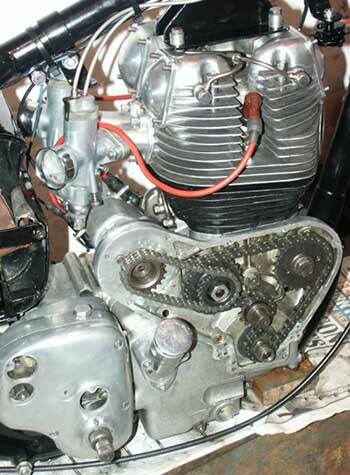 Just before the accident I had rebuilt the bottom end of the original engine (I have had the spare engine fitted for many years) and had started stripping the bike in preperation for ftitting it. It was only a couple of months ago that I felt well enough to venture out into the garage to look at it again, at first just with the intention of cleaning it up a bit, but you know how things are, once I had started stripping bits off to clean them I couldent help myself and before long the whole bike was in bits - dont I ever learn! 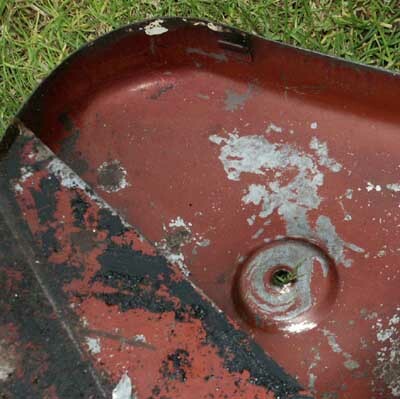 Even at this stage, with the bike fully stripped down, I was only intending to re-stove the frame and clean/replace the worst corroded bolts, but as always happens in these cases, you clean one bit and all of a sudden the bit next to it starts to look a bit grubby. I wont bore you with all the details (this is, after all, a Vincent web site I hear you sigh . . . ) but as I write this piece from our Norfolk holiday chalet in the blistering heat of mid July, I hope only to be a few weeks from having it ready to go back on the road. Now I think about it, I dont think I have ever completed a full(ish) resoration in such a short space of time, but thats partly because I have been working most nights into the early hours, in an attempt to have it ready for a show before the end of summer. 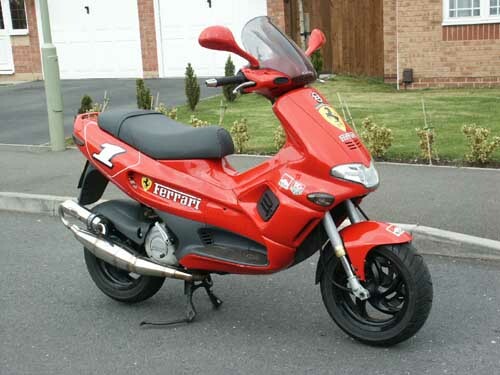 Obviously, given my current status, the biggest problem is going to be trying to ride the bike, but at least it will be sitting there ready for me when I do feel up to it. 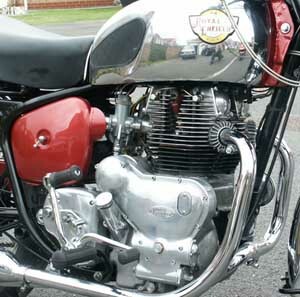 And of course, it is another bike that I will no longer look at and think - 'Mmm . . . that could do with a cleanup'! It's amazing how you take good health for granted, particularly in the workshop, but the last couple of months of hobbling around my garage has reminded me not to be so complacent about such things, it's been much more of a struggle than before the accident. So there you go, thats why I havent been updating the web site much lately. I do expect to have a couple of new sections in soon, although they might have to wait until the RE is complete, but once the long nights start drawing in I'm sure the Vincent will once again beckon. Restored bike about 3/4 complete. Although it was never intended to be a concours rebuild, it has been built to almost 100% original, and I do get satisfaction trying to maintain this through to the small details like all the genuine RE fastenings and like. 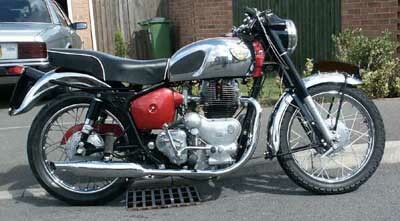 Ahh well, its been a long time coming but I finally got the Royal Enfield finished and MOT'ed this weekend. Actually, I'm embaressed to say that I actually got it going last weekend, but a weeping fork seal and a weak magneto spark stopped play. 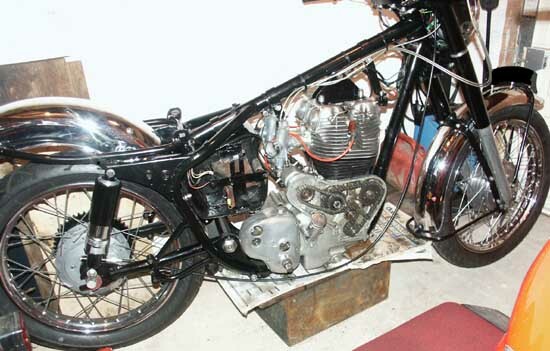 Anyway, both of these are now fixed and the bike is up and running. Engine is very new and tight, so am taking it very easy. When I first took it to the MOT station last week it was extremely hot and I went through Leicester city centre, with lots of stops and starts. After a few miles it was clear the engine was overheating, and gave signs of a slight seize. I was torn in the week between stripping it and giving it another go. I decided to continue this weekend and see how it went. 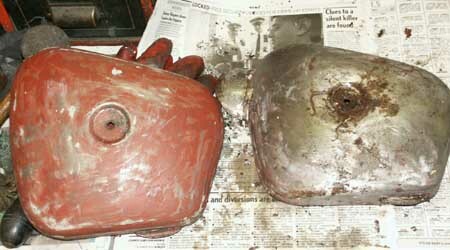 Luckily, it went much better and the engine has now done approximately 100 miles without major incident. I am probably going to strip down the heads sometime soon (to check bores etc) but will try to get a few hundred more miles on first. 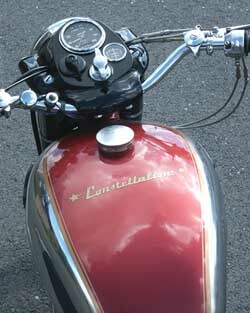 Still got a few minor jobs to do, but generally I am very pleased and it certainly feels very nice and solid to ride. Think I need a bit of a rest before getting back to the Vincent though, hope thats ok?! 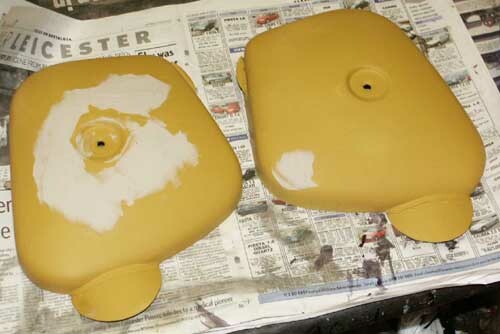 Last job after lining tank and adding transfers was to carefully place new rubber knee pads, using contact adhesive. 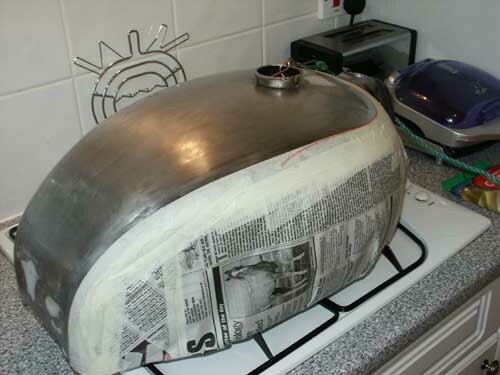 Note : most important specialist equipment - red wine, hic . 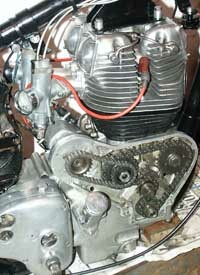 . .
Engine close up, showing siamesed pipes. 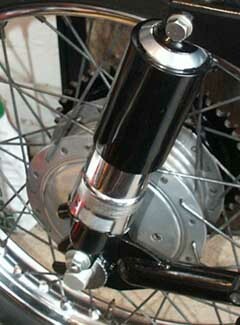 Drive Side view of finished bike. 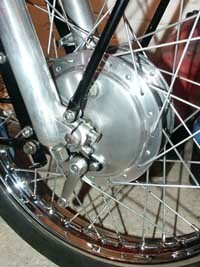 Silencer is only non-original item on bike, simply because I prefer this AJS version to the original.